Established in 1978, Building Fasteners Inc., is a wholesale distribution company providing specialty fasteners to commercial and industrial contractors for both retrofit and new construction projects. 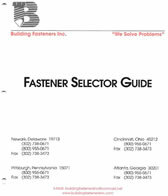 We carry a large inventory of specialty fasteners and offer same day shipping. We look forward to working with you on any current or future projects. Contact our sales team with your fastener application today. Copyright© 2016. Building Fasteners Inc. All Rights Reserved.